Browse: Home / 2012 / February / Wealth preservation: an illusion? This is the second in a short series of posts on the recent update of the Dimson-Marsh-Staunton long-term return study sponsored by Credit Suisse. Barron’s publishes annual lists of the richest families in the US and around the world. One striking aspect of those lists is the absence in the top 100 of the great fortunes of the past. The Fords, Rockefellers et al. are largely absent; the “nouveau riche” dominate the top ranks. This suggests that once a family stops accumulating wealth, having sold its strategic assets that were the original source of its wealth, and becomes a purely financial investor instead, its wealth essentially stops growing. This is not what wealth managers like to suggest to their potential clients. Their message is that they would not just preserve their potential clients’ wealth but also make a significant contribution to enhancing it. However, a closer look at the Dimson-Marsh-Staunton numbers suggests that such claims are likely to remain wishful thinking. It is extremely unlikely that we can accumulate real wealth through investment in a diversified portfolio of financial assets. Even the preservation of the purchasing power of existing wealth is a major challenge. Thus, most families may well experience a slow, steady erosion of their capital instead. Wealth must be created by means other than diversified financial investment. The long-term performance numbers for the main asset classes reported by Dimson-Marsh-Stanton seem to be largely in line with the results of other studies. For their total sample of nineteen markets, they find that equities had the highest compound real annual return of 5.4 percent in USD, bonds offered 1.7 percent and bills 0.9 percent. Since the kind of international diversification required to achieve these results would not have been feasible for most of the period, it is more realistic to look at an individual market. We choose the US even though its historical return numbers probably look too good to serve as predictors of future returns. The US benefitted, for a good part of the twentieth century, from its emergence as the leading economy in the world and from being the home of the world’s reserve currency. In addition, the US avoided social unrest, revolution and the ravages of war, unlike some other countries. As a result, its historical performance should be considered as what one might expect if “all were to go well” in the future. In fact, we do find somewhat better annualized numbers for the US than for the world as a whole: 6.2 percent for equities, 2.0 percent for bonds and 0.9 percent for bills. Thus, a portfolio consisting of equal amounts of US bonds and equities would have realized a real return of around four percent, if rebalanced regularly. This may appear as ample proof that one would have been able to grow one’s assets over the long run since, at that rate, real wealth would have grown eighty fold over the past 112 years. Even a more conservative portfolio with a lower weight in equities would have provided a positive real return. This is certainly true but the raw results ignore a number of additional factors that affect performance. They include the effective inflation rate suffered by the wealthy that may differ from the official numbers, impact of the costs associated with investing, taxation and the withdrawals of capital and, on the positive side, the potential value added from active strategies. To preserve the purchasing power of our wealth, we have to generate a return equal to inflation, i.e., a zero real return. If the return is higher, real wealth accumulates, if it is lower, real wealth erodes. But inflation is not necessarily the same for everybody: consumption baskets differ greatly across individuals. Particularly, for the well to do, many of the goods and services that they cherish have a very limited supply. As the number of wealthy consumers increases across the world, the demand for such items increases and prices rise disproportionately. As an example, as Americans and Asians discovered wine over the past forty years, demand for trophy wines such as Romanée-Conti increased dramatically yet the vineyard’s surface is still about 1.6 hectares (4 acres) and total annual production averages just about 5000 bottles. Not surprisingly, the prices of such wines have exploded. One measure of the extent to which the wealthy suffer from higher inflation is the Cost of Living Extremely Well Index (CLEWI). Compiled by Forbes since the seventies and based on US data, it is undoubtedly the most frivolous inflation index ever devised as it includes such “essentials” as yachts, airplanes, cosmetic surgery and private school fees. Barron’s found that, over the past 35 years, the CLEWI increased by 6.5 percent per annum as opposed to the 4 percent annual increase of the official consumer price index (CPI). On a more serious level, the cost of higher education, health care, fundamental scientific research and art has also increased at a much higher rate than the CPI – and these items are among the favorite beneficiaries of many families’ philanthropic activities. 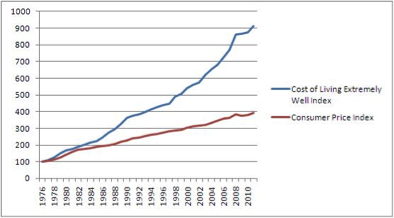 As an example, inflation in operating costs suffered by US universities, as measured by the Higher Education Price Index (HEPI), has been more than one percent higher than the CPI over the past fifty years. Thus, the wealthy generally need a positive real return just to maintain their purchasing power – be it for their own particular consumption basket or to maintain the purchasing power of their philanthropic endeavors. While, the exact number will differ from family to family, it is likely that they will need to generate a real return of about two percent after costs, withdrawals, and taxes of to maintain their true purchasing power. Given the Dimson-Marsh-Staunton results, the typical conservative investment strategy focused on bond like assets cannot provide the kind of returns required, particularly once the costs associated with investment are taken into consideration. Families differ greatly in how they structure their investment activities but there will typically be a family office that may invest directly or outsource investment to external managers. In addition, there may be consultants, legal advisors, etc. The overall cost depends on the structure that is chosen and will be higher if active investments, alternative strategies and investment in private markets represent a significant part of the assets. For a purely passive solution, the costs are minimal. For small portfolios, they would likely amount to about 0.3 percent, for the very largest portfolios, 0.1 percent or less. We shall consider the cost of adding active strategies together with their potential benefits. There is no point to wealth that is never touched. But any withdrawal, whether for the support of family members or for philanthropic purposes, reduces the capital on a one for one basis. If there are explicit liabilities imposed on the fortune, e.g., through the trust deed of a philanthropic entity or because family members depend on capital distributions for support, their impact is like that of any other fixed cost. In contrast, if there are no explicit liabilities that need to be covered, withdrawals can always be set to a level that minimizes their impact on the purchasing power of the portfolio. Taxes are potentially the greatest threat to the preservation of wealth. An effective, but legally sound strategy that minimizes the impact of tax by structuring investments in a tax efficient manner or by deferring tax liabilities can make an enormous difference. Tax is particularly insidious in connection with inflation. Consider an instrument that offers a taxable real return of two percent. With no inflation and a tax rate of 30 percent, we are left with an after tax real return of 1.4 percent. Now add five percent of inflation. In this environment, the instrument offers a seven percent nominal return with tax amounting to 2.1 percent. This leaves a 4.9 percent nominal return but a -0.1 percent real return after tax. Inflation is indeed a tax in itself. Dimson-Marsh-Staunton explicitly discuss the relation between asset returns and inflation. We ignore those results in this discussion but will return to them in a subsequent post. At this point, let us just note that their results show that the impact of inflation on asset returns is actually even worse than is suggested here. Given the costs enumerated so far, finding additional return sources would obviously be greatly welcomed. There are two potential methods to enhance returns. One is to shift the asset allocation towards higher risk assets in order to capture more of the higher risk premia of those assets. This method requires no skill but can be extremely dangerous. Unless all family members are extremely risk tolerant, an overly aggressive strategy is usually abandoned in the midst of the first crisis – when the negative impact is maximized. The aggressive harvesting of risk premia requires good nerves and the courage to look away in periods of extreme stress. The second way to enhance returns is through active management, be it in traditional or alternative strategies. It will only ever work for a minority of families since it is largely a zero sum game before costs. In addition, active managers have an unfortunate tendency to extract most of the value that they hope to add in the form of fees. Thus, the careful selection of such managers is of great importance. This means that families who pursue active strategies must ensure that they have access to the appropriate resources who will offer them a reasonable chance of adding value through manager selection. These resources will not be cheap. But for those who do it well, active management may make the difference between erosion and preservation of their capital. The message is unfortunately rather simple. If you accept the argument that the wealthy usually suffer from a higher effective inflation rate, you must also accept the result that, based on the (optimistic) Dimson-Marsh-Staunton numbers, the usual conservative investment strategies will most likely ensure a slow but steady erosion of the purchasing power of assets even with minimal withdrawal of capital and assuming a highly favorable tax regime. Only those families who are both very wealthy and willing to pursue more aggressive strategies may find themselves able to withdraw some capital and yet maintain their purchasing power. The table shows a very simple template with a worked example. The numbers largely follow the discussions above. The two percent withdrawal rate is probably at the low end of the range for most family trusts and foundations. It may be tempting to “improve” the results by being aggressively optimistic in one’s forecasts for asset and active returns and conservative with costs and taxes. But this is unlikely to change the fundamental reality: while the dream of a fortune that will last forever is obviously attractive, the evidence suggests that it will remain an elusive dream for most families. This is true without even considering the most likely reason for the dissipation of family wealth: the fact that families tend to grow at an exponential rate. We have argued in this post that it is difficult to maintain the purchasing power of a fortune assuming that it stays in one piece. But once the usual centrifugal forces that affect second or third generations come into play, that fortune will usually be split up at some point anyway. The results are somewhat sobering. Wealth preservation seems to be as difficult as wealth creation. Only a minority of the wealthy can hope to preserve the purchasing power of their wealth once wealth accumulation stops. Thus, perhaps the most obvious advice that one can give to families is to resist the temptation of selling their strategic assets. Once they are gone, wealth erosion is almost inevitable. While it is unlikely to be of great consolation to most families, the fact that capital preservation is difficult is probably highly desirable from the viewpoint of social harmony. If it were very easy to stay very rich, it would be correspondingly more difficult to acquire wealth. The forced recycling of wealth implicit in our results will give those not yet wealthy hope that they may succeed and acquire wealth through traditional means. If there were institutional barriers to wealth creation, as there were in feudal systems and as there are in repressive regimes, more radical solutions for acquiring wealth such as revolutionary or criminal activities might seem to be highly attractive ways to join or replace the privileged.